Founded in France in 1889, the tyre manufacturer Michelin has long been a strong advocate for road safety. In 1900, Michelin first published the Michelin Guide, informing drivers about good practice for the use and maintenance of tires, together with a list of useful addresses to locate garages, fuel stations, tire dealers, among others. This established the company’s reputation for road user care and safety. Focusing on education and awareness raising, Michelin launched a campaign to raise awareness among all road users, featuring the 10 Golden Rules for Road Safety. The visual campaign is designed to remind road users of key rules for caution on the roads. The company is also actively involved in raising young people’s awareness on road safety in Europe, North and South America and Asia. Michelin launched the Road Safety for Young People in Europe and Michelin Best Driver in Brazil programmes to address road crashes being the world’s leading cause of death amongst the 15-19 year-old age group. The Michelin Corporate Foundation was created in January 2014 under the initiative of Jean-Dominique Senard, the President of the Michelin Group, under the sign of “Helping people move forward”. It follows Michelin’s traditional societal commitment by echoing the values of respect and solidarity borne by the Group since its creation. To do so, the Foundation supports projects that are innovative, engaged in the life of the “City”, coherent with the Group’s activities and close to its collaborators and sites. Road safety education has always been a priority for the Michelin Group. Its corporate foundation is strongly engaged in the cause, which is why it chose to support the Association Prévention Routière. 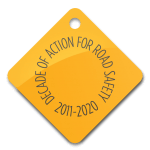 This private association is among the most active in France in terms of road safety sensibilisation and education. Known for its prevention campaigns on a national scale, it also drives targeted actions, especially towards youth. To this end, the association has at its disposal 1,500 volunteers and trains speakers in road safety (law enforcement officers, police officers, municipal employees…). Thus, in 2014, the association sensibilised 1.2 million children and youth.